It was a few years ago when I last spent some time in Vienna with my family. The week there was filled with Concerts, Operettas, Operas and Plays…….it was the Musik Woche in Vienna…….. While there a childhood friend had telephoned and asked to meet him and his family in the Wiener Wald Kaffee for an afternoon of reminiscing and catching up. It was a time of nostalgia – as we remembered our youth and at the same time we exchanged stories of our happy times with our spouses and children…..life had gone on…..to be better and more fulfilling. We did all that over coffee and pastry…….the kind of pastry that one can only find in Vienna. When the pastry cart arrived my eyes simply overflowed with delight and my heart beat a little faster. I simply could not make a choice from the selection that I saw in front of me. I really wanted a bite of every one of the most beautiful pastries I had ever seen. My friend suggested the Kaese Sahne Torte. It was a huge slice and I knew that I could never finish it – even with the help of the cup of coffee. I was totally in love with this pastry! Next morning I spent several hours on the Ring Strasse visiting every book store that was there, in search of a cookbook that contained the recipe of this most incredible dessert. By the time I found a pastry cookbook that had the description and ingredients listed for a Kaese Sahne Torte……my hands were shaking and I hardly could pay for my treasure. Every evening on our trip I was studying this beautiful cookbook and could not wait to get home to start translating it from German into English. But, not only the language had to be translated also the measurements of the ingredients. It took me many trials……but, now I have this most incredible pastry recipe in my files…..executed in an American Kitchen. 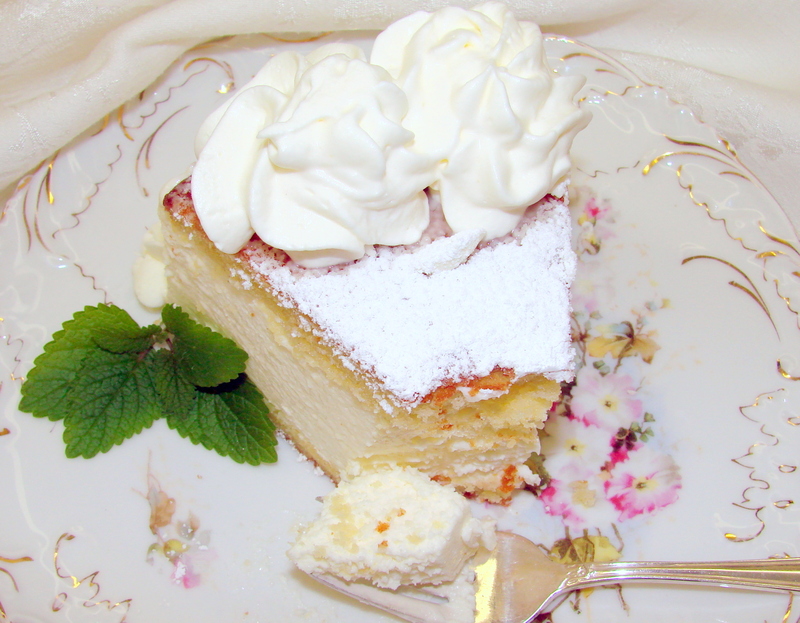 My husband and son claim the Kaese Sahne Torte to be their most favorite pasty of all the other recipes that I have translated from Austrian cookbooks. Today I am going to share this most incredible cake with you! It is not difficult, but you have to be organized and follow my directions explicitly. I am going to write the procedure as if I were to teach it in my cooking class which is different than most recipes are written in today’s blogs or cook books because, there are certain points in the recipe that are very critical in attaining the results that you have to have at the end. And, I so want you all to be able to make this special dessert. As you can see from the picture there is a 2 to 3 inches filling between two cake layers. Prepare a 10 inch Spring Form baking pan: have a 10 inch round parchment paper to cover the bottom of the spring form…this is to avoid the cake to stick to the bottom of the pan….I have greased and dusted the pan originally, but found that it would stick more often than not…therefore, I now use the parchment paper to avoid this problem….Do NOT use wax paper…unless you are used to working with it…I prefer parchment paper.. I do grease and dust the sides of the spring form however. 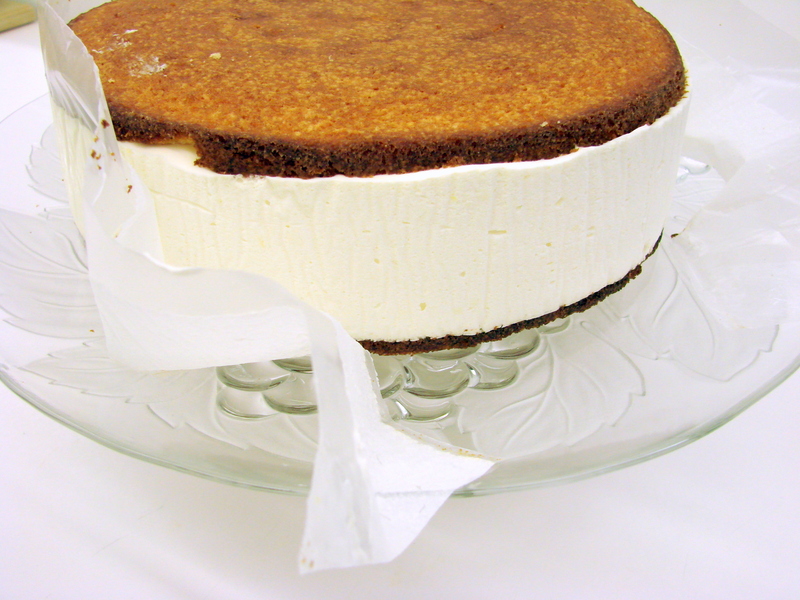 I use a Stand-up Electric Mixer – add the butter and the sugar and beat them until very light in color. Add the eggs one at a time – and incorporate the eggs until the whole mass is light and fluffy. Add the 2 tsp Vanilla and mix well. Add the flour and baking powder, they do not have to be mixed and sifted – just add them into the batter and incorporate them well. Pour the batter into the prepared spring form and bake it in a preheated oven…set at 350 F. Depending on your oven…it will have a light brown color in about 20 to 30 minutes…or it is baked when tested with a toothpick . Remove the cake from the oven and let it cool on a rack. This part of the Sahne Torte can be prepared a day in advance and kept at room temperature covered with a tea towel. 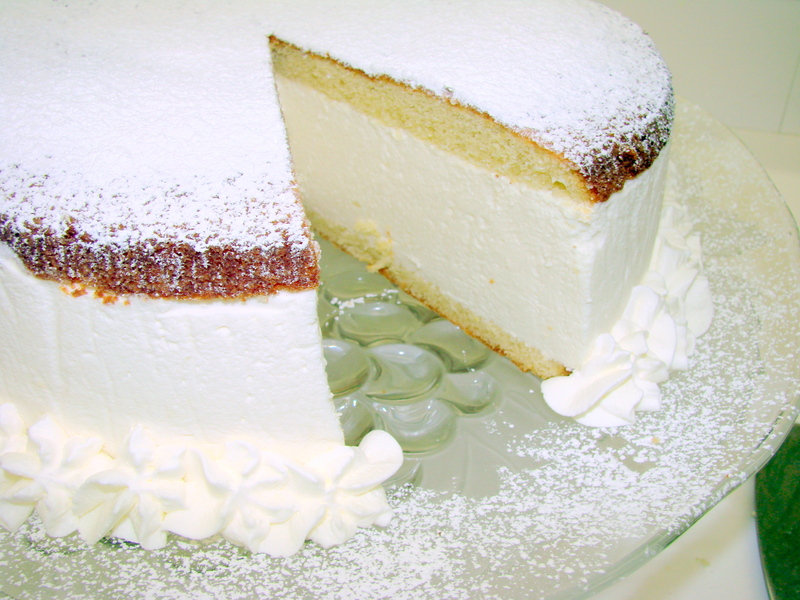 When cooled – take the cake out of the Spring form and cut the cake horizontally in half ….you need one halve for the bottom and another for the top…. 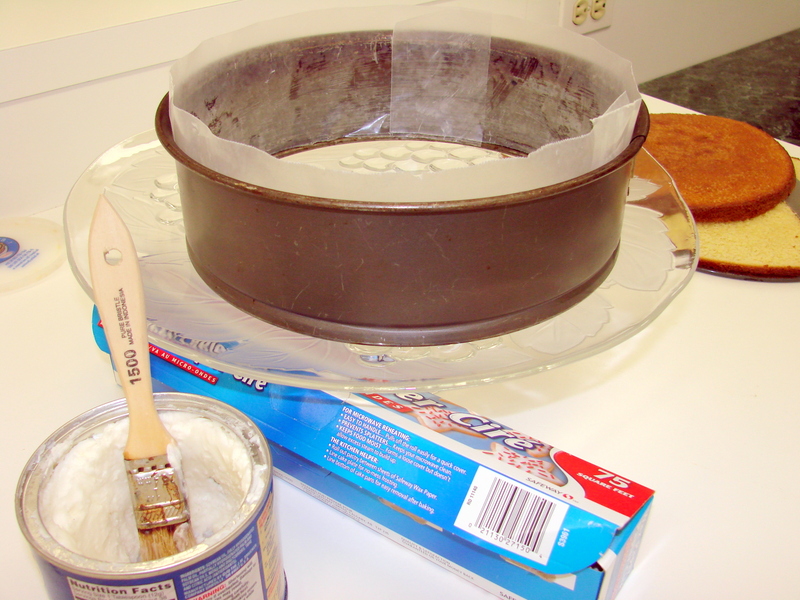 Take a cake platter or a cardboard…if a cardboard is used cover it with foil..
Take the 10 inch spring form, ring only, and grease it with butter or Crisco and place it onto the cake platter; line it with wax paper strips. The wax paper needs to be cut wider than the spring form ring so that it is about 1 inch higher than the ring itself. When lining the ring overlap the wax paper to cover the whole interior surface of the ring. The most important part of the cake! 2 cups heavy cream – need to be very cold, straight from the refrigerator, the colder the cream the quicker it will thicken. Dissolve gelatin on low heat or (or, microwave 2 times for 10 seconds) set aside to cool. Softened gelatin needs to stay warm or it will congeal again. In a food processor cream the cottage cheese and cream cheese making sure that the mass is very, very smooth…there absolutely cannot be any lumps. The processing might take about 10 minutes or more. Beat egg whites and 1/3 cup of sugar until soft peaks form and set aside. When the egg whites are half way whipped the sugar needs to be added slowly…..one spoon at a time and beating after every addition of sugar…the crystals of the sugar need to be dissolved between every addition. 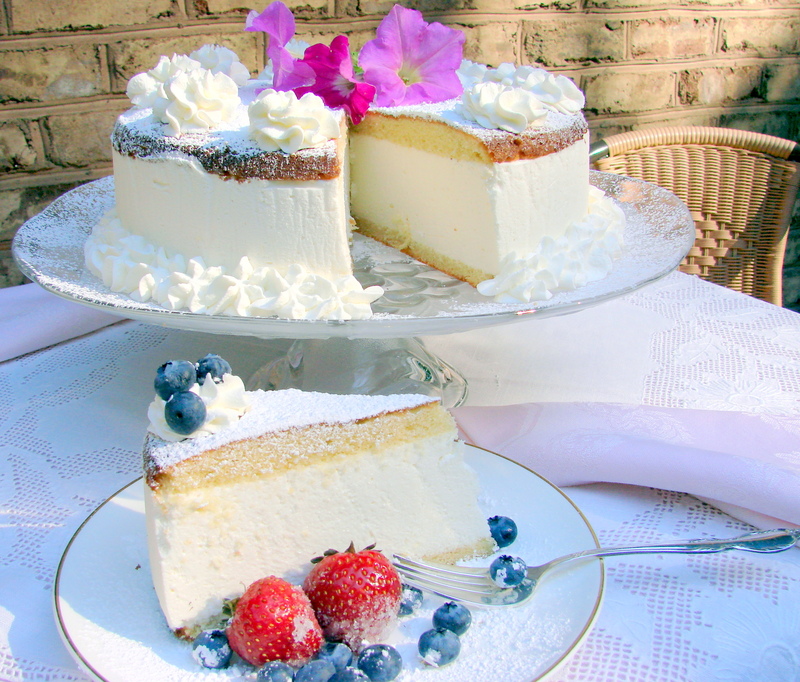 Whip heavy cream until it forms soft peaks…this is very important…do NOT beat cream until it has a yellow hue….also, add the 1/2 cup confectioner sugar slowly when the cream is half way whipped and continue until soft peaks form. When cream is whipped and shows a pale yellow hue…it is one step before it is butter, it is better to under whip it. If the confectioner sugar is slightly damp and is lumpy…sift it to eliminate lumps then add it to the cream slowly while slowing down the speed of the mixer. Mix gently – there cannot be any lumps in this filling. I am going to repeat – how to mix the three masses together. Use a whisk with the least amount of wires that you have in your kitchen. I found that a densely wired whisk does not work…since this is a very light mixture and you are mixing not whisking ….the gelatin holds it together at the end after it is refrigerated. You have the cheese mixture from the processor already in a large mixing bowl. To that add the meringue while mixing small portions at a time with a whisk until the mass is very smooth. This is very important…the meringue has to be mixed into the cheese mixture FIRST. If you mix the cold whipped cream first you will have big lumps in your mixture. The cold whipped cream congeals the gelatin in the cheese mixture instantly and creates the lumps, therefore, make sure that the whipped cream is added last. If you follow my method you will prevent having lumps in your Sahne Torte. Pour all the cheese filling into the prepared spring form, it will fill it to the top or a little higher than the rim of the ring, then place the second half of the cake on top. I use a tart pan bottom to transport the cake layer to prevent breaking it. If you have some of the filling left over, fill small bowls or glasses for a treat before your guests arrive. 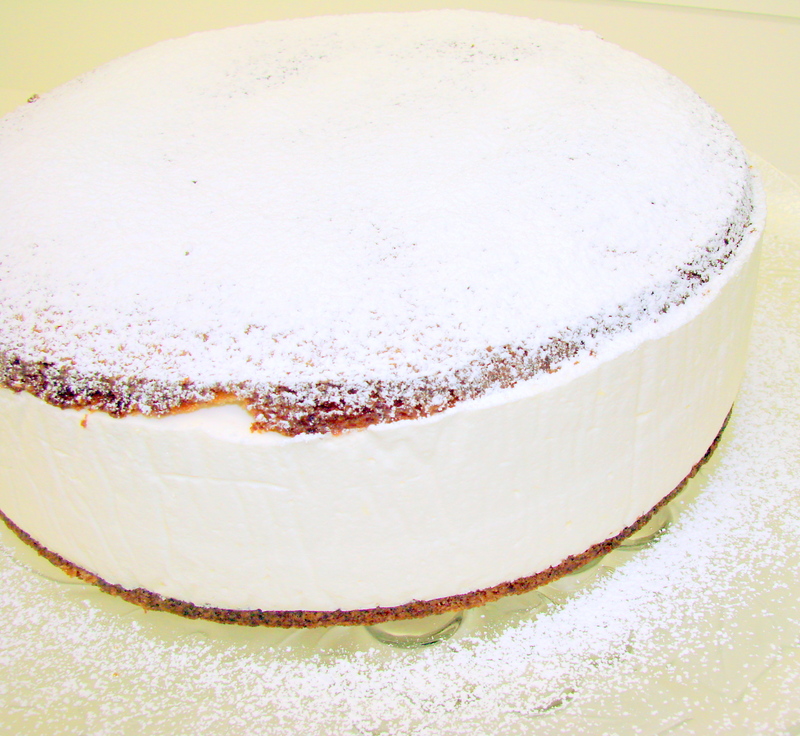 Refrigerate the cake at least for four hours or overnight before serving. To un-mold the refrigerated cake…. Release the spring form ring from the cake…wiggle the ring a little to loosen it around the cake and lift it away from the cake. Peel off the wax paper around the cake, sprinkle it with powdered sugar and it is ready to be served. You can decorate it with some piped whipped cream and fruit or use some fresh flowers….make sure they are not poisonous. Check with Google for edible flowers. To make it even more special you can mix some Plum Jam or any jam with a little Kirschwasser and spoon it over each slice before serving….or have a bowl of the jam mixture at the table and let the guests serve themselves. I will be happy to answer all of them! 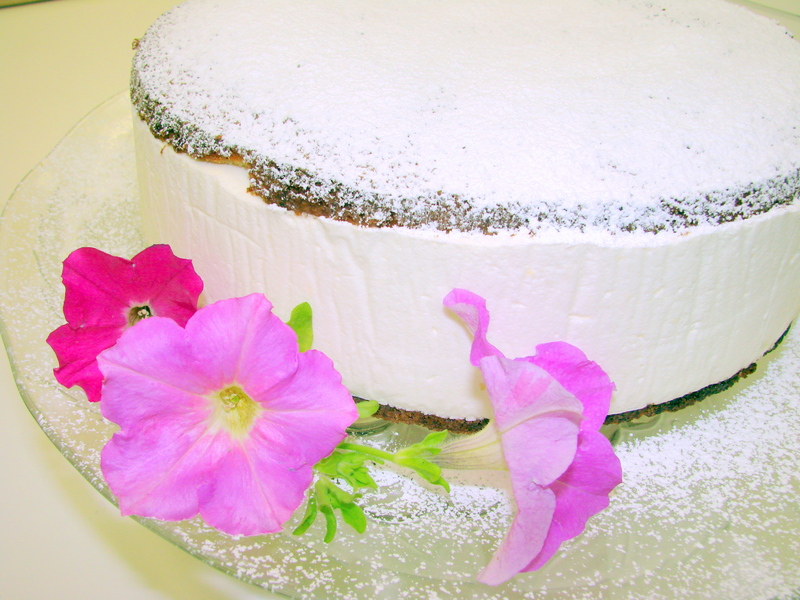 And do let me know if you like the Kaese Sahne Torte! Find me on Face Book! LinkedIn and Pinterest!